Unity LauncherSwitcher (LSwitcher) is a new tool which can be used to organize the Unity Launcher by letting you control which apps should be displayed (pinned) on the Launcher depending on the current workspace. The application remembers which apps are pinned to the Unity Launcher for each workspace and it automatically changes the Launcher when you switch between workspaces. This can be useful for those who have trouble finding apps on the Unity Launcher because it gets too crowded as well as for those who want to have different workspaces for different task categories - for instance, a workspace for web-related stuff, another one for work, etc. 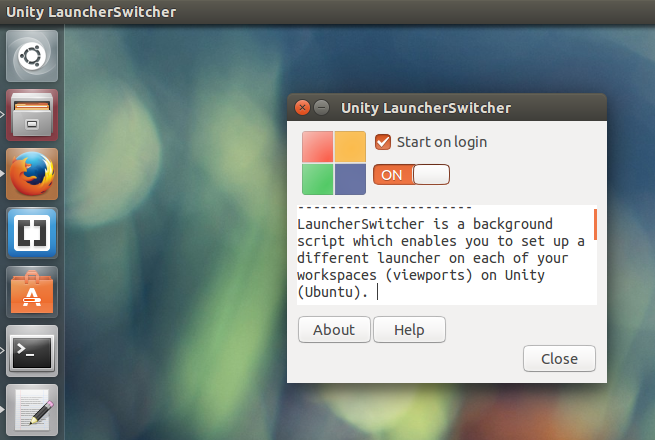 Using Unity LauncherSwitcher is as easy as it gets: the app comes with only two options: one which allows you to enable or disable saving the Unity Launcher state (so enable this or else nothing will happen when changing workspaces and pinning apps) and another one for enabling the app to start automatically on login. As you would expect, this app only works if you're using Unity with multiple workspaces enabled (System Settings > Appearance > Behavior > Enable workspaces). Or, if you don't want to add the PPA, you can grab the Unity LauncherSwitcher deb from HERE (but you won't receive any updates unless you use the PPA). If you encounter bugs, report them @ Launchpad.